On March 7, 1990, Wayne Huizenga, CEO of Blockbuster Entertainment Corporation, announced he had purchased 15 percent of the NFL’s Miami Dolphins and 50 percent of the Dolphins’ home, Joe Robbie Stadium, for an estimated $30 million. Huizenga stated his intention to aggressively pursue an expansion franchise. MLB had announced a few months earlier that it intended to add two new teams to the National League. It was a foregone conclusion that one of them would be placed in Florida; the only question was whether Huizenga would beat out competing groups from Orlando and Tampa Bay. Orlando fielded a very spirited campaign bolstered by its family-oriented tourism industry. Tampa Bay already had a baseball park the Florida Suncoast Dome in St. Petersburg, completed in 1990. However, on June 10, 1991, the National League awarded a Miami-based franchise to Huizenga for a $95 million expansion fee. One name considered early on was the Florida Flamingos. The 2003 World Series marked the 99th edition of the World Series. The Florida Marlins defeated the New York Yankees in six games, 4–2. This is also the most recent Series in which the losing team outscored the winning team. The Yankees lost, despite outscoring the Marlins 21–17 in the Series. 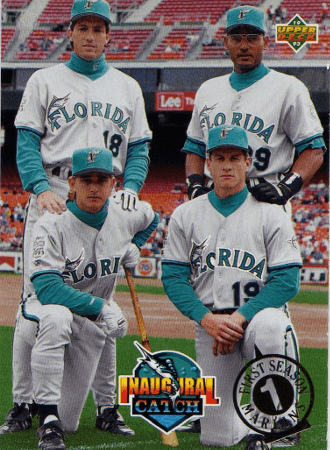 Founded in 1991 as the Florida Marlins, the Marlins began play in 1993 in the suburb of Miami Gardens, and moved to the city in 2012, becoming the Miami Marlins at that time. Marlins – The old nickname was revived from back in the 1950’s from the International League and Florida State League called the “Marlin,” a popular sporting fish. 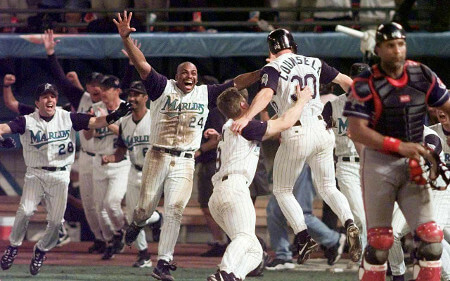 Who is the greatest Florida Marlins? Founded in 1991 as the Florida Marlins, the Marlins began play in 1993 in the suburb of Miami Gardens, and moved to the city in 2012.